Plain, Chive, Garden Garlic, Sundried Tomato, Jalapeno, Strawberry, and Honey Nut. Butter, Jelly, Peanut Butter, Honey, Nutella, Hummus, Avocado. All Sandwiches come with your choice of bagel, croissant or English muffin. Teas– We freshly brew Stash Teas for all of our drinks. We offer English Breakfast, Premium Green, Peppermint, Moroccan Mint, Chamomile. Orange Spice and Lemon Ginger Teas. Matcha– Our Matcha lattes and blended drinks are made with powdered matcha powder and your milk of choice. *Soy, Coconut, Oat and Almond Milks are also available. Smoothies – All of our smoothies are made with Frozen Fresh Fruit and your choice of Juice, Milk or Redbull. All Sandwiches are served on your choice of bagel or bread. 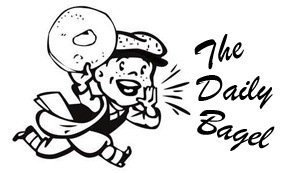 The Daily Bagel strives to make and keep happy customers. All our food is made and hand crafted with care. We buy the freshest products to ensure the highest quality! No microwave here! All of our food is cooked to order on our flat top and bagels are freshly toasted when you order. Questions or Comments?